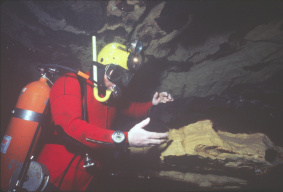 Donald N. Rimbach, one of the pioneer cave divers from the early 1960s, died April 6, 2005. He was 5 days from his 63rd birthday. Rimbach, from Webster Groves, Missouri, was one of the first cold water spring/cave divers, and invented several means of underwater silent communication, including one now known as the Rimbach method. 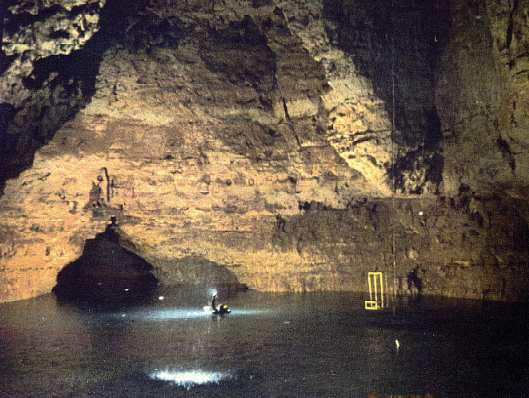 He, along with partner Michael Tatalovich, (amongst others) was one of the first people to dive and map Missouri's large spring systems, with an eye to understanding their hydrology and geology, founding Ozark Spring Studies in 1973. His penetrations were limited to the realm of air dives, as mixed gas technology had not been invented at the time. Many of these maps were published in Springs of Missouri, by Vineyard and Feder, 1974. Rimbach was a Navy welder, an employee of his father's water and wastewater engineering firm, and a self-employed general welding contractor. Rimbach attended Southwest Missouri State University, majoring in geology, but did not graduate. 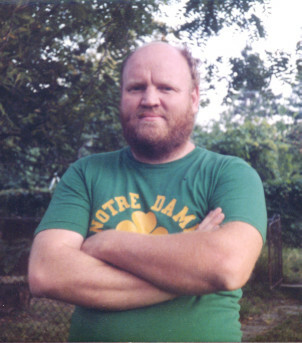 Mostly field-educated in Missouri and karst geology, he took his knowledge of caves and karst into the activist arena when he spent 6 years from 1973 to 1978 and over 400 public lectures and debates questioning the Army Corps of Engineers' plans for the the Meramec Park Lake Project in east central Missouri. During part of this time, he was employed at Onondaga Cave by Lester Dill as the cave geologist. Along with the Sierra Club, who sued under the Endangered Species Act protecting Indiana bat sites which the proposed dam would have inundated, Rimbach used his geologic knowledge to write a large pamphlet "Meramec--A Dam Site Worse than Teton" and present arguments which help to delay dam construction, and force a public vote on the issue. The dam was defeated in a non-binding referendum in 1978, and deauthorized by Ronald Reagan in 1981--one of the few Corps projects to ever be derailed by public opinion. The Meramec Dam Controversy. 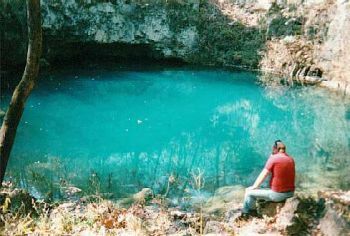 Although Don surveyed, mapped and took copious biological notes on many dry Missouri caves, his first love remained the springs. Ill health prevented much active diving after 1986, but he always considered himself a diver, first and foremost. He was often consulted both on the springs themselves and on landowner relations, especially with government landowners. 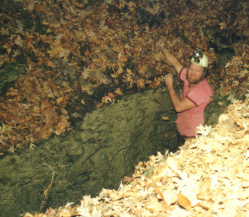 Don was intermittently a member of the NSS, the Missouri Speleological Survey, and various grottos, but he was one of those people who needed no introduction in any gathering of Midwestern cavers. He earned the Lester B. Dill Award from the MVOR Region in 1988. In his later years, Rimbach gated caves, worked against new lead mining in the South Central Ozarks, and continued to encourage new cavers as well as concoct new projects at about the rate of one a week. There was never enough time nor money to do everything he wished to. Rimbach suffered a stroke in March of 2001, and another in August of 2002 which necessitated him moving to a Veteran's Home. Although hampered by stroke effects, he never gave up his efforts to improve his physical condition, nor lost his determination to make the best of his situation, which found him partially immobile and confined indoors nearly all of the time. In August of 2003 he was honored at the Meramec Milestones celebration of the 25th anniversary of the defeat of the dam. Don was divorced, and left no children. A memorial and picnic for Don Rimbach was held Saturday April 23, at Picnic Shelter #3, (near Camper Spring) Meramec State Park, Sullivan, Missouri, on the banks of the Meramec. Approximately 60 people brought memories of Don to share. The memorial featured a cave trip to the last cave Don visited, as well as a hike to the base of the dam that never was.